Represents a player. This only applies to players which are currently connected to the server. Attaches a GUI element to the player's hud. Attaches a GUI element to the player's screen. Adds the provided WorldElement to the player's world. Bans the player permanently from the server. Bans the player from the server for a given amount of time. Connects the client to a Discord server, or more precisely, it opens the url to the Discord server in the web browser. Connects the client to a TeamSpeak server, but only as long as TeamSpeak is installed on the client computer, and only if the client accepts to connect. Creates a screenshot of the player screen and convert it into a BufferedImage. Disables the "area selection tool" for this player. Disables certain keys for the client. Enables the "area selection tool" for this player. Re-enables all keys which have been disabled by calling disableClientsideKeys(int...). Re-enables certain keys which have been disabled by calling disableClientsideKeys(int...). Executes a console command for this player. Gets the currently selected area. Gets the current armor level of the player. Gets a Vector3i containing the current block position (x, y and z) of the player within the current chunk. Returns the cardinal direction of the player. Gets a Vector3i containing the x, y and z coordinates of the current chunk the player is in. Gets a Clothes object which contains the clothes the character is currently wearing. Gets a list of all Areas the player is currently in. Gets the amount of time the player is connected to the server. Gets the database ID of the player. Gets the currently equipped item (i.e. the item the player currently holds in his hands), or null if no item is equipped. Returns the heading/facing, i.e. the player rotation around the y axis (vertical axis) in radians. Gets the current health of the player. Gets the current hunger level of the player. 100 means the player is not hungry, 0 means the player is starving (i.e. the player looses health). Gets the current ID of this player. Gets the player idle time in seconds. Gets the inventory of the player. Gets the ip of the player (only relevant in multiplayer). Gets the current ingame language of the player. Gets a timestamp (i.e. the number of milliseconds since 00:00:00 UTC on January 1, 1970) when the player was online on this server most recently. Gets the maximum armor level the player can have. Gets the maximum health the player can have. Gets the mount the player is currently riding on. Gets the name of the player. Gets a setting from the client (a setting from his config.properties file). Gets the current permission group name of the player. Gets a particular permission value (usually boolean, int, String) from the current player permission. Gets the current ping of the player, in other words, the amount of time (in milliseconds) that passes until a player packet arrives at the server. Gets a Vector3f containing the current global x, y and z coordinate of the player. Gets all keys that are registered. Gets the estimated respawn position (i.e. the position the player will respawn once he died [or once he gets respawned forcefully]). Gets the current player rotation. Gets the current screen width (horizontal resolution) the player set for his game. Gets the current screen height (vertical resolution) the player set for his game. Performs a raycast from the screen xy position. Gets a Skin object which represents the appearance of the character, i.e. gender, haircut, skin color, hair color etc. Gets the player stamina. 0 means the player is fully exhausted (so the player cannot sprint anymore), 100 is the max value. Gets the current system language of the player. Gets the current player temperature (in celsius). Gets the current thirst level of the player. 100 means the player is not thirsty, 0 means the player is dying of dehydration (i.e. the player looses health). Gets the total amount of time the player has spent on this server (or more precisely, the amount of time the player has spent on this world). Gets the globally unique ID of the player. Gets the current view direction of the player. Gets whether the player has broken bones or not. Gets wheter or not the player is an admin (according to the server.properties file). Gets whether the player is bleeding or not. Gets whether or not the player is (still) connected. Gets whether or not creative mode is currently enabled. Gets whether or not the player is currently crouching. Gets whether or not the player is dead. Gets whether or not the player is currently fishing. Gets whether or not the player is currently flying (i.e. flymode enabled). Gets whether or not the player is inside a cave. Gets whether or not the player is inside a building. Gets whether or not the player is currently in lava. Gets whether or not the player is currently inside a vehicle (either as driver or passenger). Gets whether or not the player is invisible (i.e. if a plugin has set the player invisible). Gets whether or not the player is currently in water. Checks if a particular key is already registered. Gets whether or not the player is currently laying in a bed, tent or shelter. Determines if the client does forward his key input to the server or not. Gets whether or not the player is currently playing a piano. Gets whether or not the player is currently sitting on a chair. Gets whether or not this player is currently sleeping. Gets whether or not the player is already spawned, i.e. if he's no longer in the loading screen. Gets whether or not the player uses the Steam version of the game. Gets whether or not the player is currently under water. Moves the player (smoothly) to the target position. Plays an ingame sound effect at the position of the player which can only be heard by this player. Plays an ingame sound effect at the given world position which can only be heard by this player. Plays an ingame sound effect at the given world position. Plays a custom 2D sound (i.e. it can be heard everywhere, but only by this player). Plays a custom 3D sound at the given position. Performs a raycast from the player view position to the player view direction, i.e. from the cam position to the center of the screen (crosshair). Performs a raycast from the player view position to the provided direction. Performs a raycast from a world position. Defines the key inputs the client should forward to the server. Removes all GUI elements that are attached to the player's hud. Removes all WorldElements from the player's world. Removes a GUI element from the player's hud. Removes a WorldElement from the player's world. Requests a raw map tile from a client. Respawns the player at the given position. Sends a text message to the player's chat. Displays a message with big letters in the middle of the screen of the player for a few seconds (depending on the length of the message). Gives admin rights to the player. 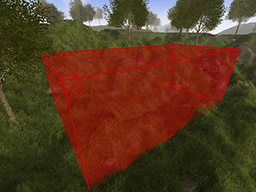 Sets an area for the "area selection tool" for this player, i.e. the selection tool will adapt to the position and size of the provided area. Stores an attribute for the player. Sets the bleeding state of the player. Sets the broken bone state of the player. Sets the chunk and block position of the player (resulting in the total global position). Enables or disables creative mode for this player. Changes the equipped item (i.e. the item the player currently holds in his hands). Sets the flymode for the player. Changes the visibility of the GUI element only for this player. Sets the health of the player. Sets the hunger level of the player. 100 means the player is not hungry, 0 means the player is starving (i.e. the player looses health). Sets the jump height for the player. Sets if the client should forward his key input to the server or not. Moves the mouse cursor of the client to the specified xy coordinates. Toggles the visibility of the mouse cursor. Changes the name of the player. Sets the graphics/audio/game settings for the client. Sets the permission group of the player. Sets the global position of the player. Sets the player rotation from euler angles. Sets the running speed for the player, i.e. the default movement speed. Changes the pitch of a sound instance. Changes the position of a sound. Changes the track position / timeline position of the sound. Changes the volume of a sound instance. Sets the sprinting speed for the player, i.e. fast movement. Sets the player temperature (in celsius). Sets the thirst level of the player. 100 means the player is not thirsty, 0 means the player is dying of dehydration (i.e. the player looses health). Sets the view direction of the player. Sets the walking speed for the player. Shakes the player screen, like an earthquake. Shows a context menu with the given entries. Brings up the ingame map. Shows a status text message (centered, bottom of the screen). Shows the content of a chest/storage. Stops / aborts the current input actions. Unregisters a key (or multiple keys), so the client no longer forwards the input to the server. Gets the current ID of this player. This ID will change the next time the player joins the server (or if the player leaves the server, another player might get this ID). Gets the globally unique ID of the player. This ID will never change, even if the player joins another server. For Steam users, this method returns the SteamID64. the globally unique player ID as a 64 bit (long) value. Gets the database ID of the player. This ID is only unique on the current world. If the player joins another server (or loads another world), he will get a different database ID. The database ID is useful for database queries. name - the new player name. the total play time of this player (in seconds). the player permission group name or null if no group is set. groupName - the group name. Set null to remove the player from any permission group. key - the name of the particular permission key. the permission value which belongs to the provided key, or null if the permission key does not exist. Overrides a permission value. This does not change the permission group of the player, but grants him individual permissions. Note that these changes are not permanent, i.e. if the player reconnects or if the player gets assigned to another permission group ("setplayergroup"), these changes will be reverted. key - the permission key. set - set true to give admin rights to the player, or false to revoke admin rights. the inventory of the player. the equipped item, or null if no item is equipped. quickslot - the quickslot focus (hotbar) which holds the desired item. Sends a text message to the player's chat. You can use color codes ([#RRGGBB], RR is the hex red color, GG the hex green color, BB the hex blue color) in the string to color a specific part of the text (or the whole text). message - the message you want to send to the player. message - the message you want to display on the player's screen. Shows a status text message (centered, bottom of the screen). Status messages are used by the game to display certain information to the player, e.g. status of object placement, food consume info etc. message - the message you want to show. duration - the duration (seconds) how long the message will be displayed. Sets the graphics/audio/game settings for the client. This only works for settings which are also accessible from the options menu. setting - the name of the setting (see config.properties file). value - the new value. Set null to reset this setting to default. Gets a setting from the client (a setting from his config.properties file). The returned setting is always a string, so you have to parse it accordingly. If the setting is not set (i.e. field in the config.properties file is blank), an empty string is returned. If the setting does not exist, null is returned. Since the data is queried from the client, you do not get the result as a return value, instead you have to use a callback to receive the result. setting - the setting you want to query, e.g. "input_interaction" or "graphic_fullscreen" etc. callback - the Callback object. It will be called once the data has been retrieved from the player. The result will be passed as a string argument (empty string if setting is not set, null if setting does not exist). Stores an attribute for the player. You can store any type of object. Note that all attributes will be reset upon server restart. value - the value/object you want to store. Set null to remove the attribute. Removes a player attribute. Does nothing if the attribute doesn't exist. the global player position as a Vector3f (float). speed - the speed (how long it should take to move the player to the target position). the chunk offset as a Vector3i (int). Gets a Vector3i containing the current block position (x, y and z) of the player within the current chunk. X ranges from 0-15 (inclusive), Y ranges from 0-63 (inclusive), Z ranges from 0-15 (inclusive). the block position within the current chunk as a Vector3i (int). chunkPosition - chunk offset as a Vector3i (int). blockPosition - block position within the chunk as a Vector3i (int). cx - x chunk offset. cy - y chunk offset. cz - z chunk offset. bx - x block position within the chunk. by - y block position within the chunk. bz - z block position within the chunk. the player rotation as a Quaternion. quaternion - the quaternion which describes the desired rotation. pitch - the rotation around the x axis (left axis). yaw - the rotation around the y axis (vertical/up axis), "heading". the view direction as a Vector3f (float). Sets the view direction of the player. You can use this function to force the player to look into a certain direction. direction - the new view direction as a Vector3f (float). Make sure to use a unit vector. directionx - y component of the new view direction vector. directiony - y component of the new view direction vector. directionz - z component of the new view direction vector. Returns the heading/facing, i.e. the player rotation around the y axis (vertical axis) in radians. If the player looks exactly to north, 0 will be returned, if he looks to south, PI (180 degree) will be returned. the player heading/facing, i.e. the rotation around the y axis. Returns the cardinal direction of the player. If the player faces towards north, this function returns "N", if he faces towards east, it returns "E", if he faces towards north-east, it returns "NE" etc. the cardinal direction. Returns either "N", "NE", "E", "SE", "S", "SW", "W" or "NW"
Gets a list of all Areas the player is currently in. Do not modify this list! a list of all Areas the player is inside. Never null. 3 //do something with the "area"
duration - the duration, in seconds. true if the player is fully spawned, false if he is still in the loading screen (loading the world or connecting to the server). true if the player is fishing, false if not. true if the player is in a vehicle (e.g. boat, car, train etc), false if not. true if the player is crouching, false if not. true if the player is laying in a bed (or tent or shelter), false if not. true if the player is sitting on a chair, false if not. true if the player is currently playing a piano, false if not. true if the player is in water, false if not. true if the player is under water, false if not. true if the player is in lava, false if not. true if the player is inside a building, false if not. Gets whether or not the player is inside a cave. Note: If the player is inside a building in a cave, this function returns false. true if the player is currently inside a cave. true if the player is currently sleeping, false if not. 21 //Set time to 8 a.m.
25 //their position (this automatically resets the sleeping state). 26 //Since there is no "wake up" method, we have to use this "workaround"
set - set true to enable creative mode, false to disable it. true if creative mode is currently active, false if not. the current health of the player. the maximum possible player health (usually 100). health - the new player health. the current armor level of the player. Returns 0 if the player has no protection. the maximum possible armor level of the player. the current hunger level of the player. hunger - the new hunger level (0-100). the current thirst level of the player (0-100). thirst - the new thirst level. true if the player has broken bones, false if not. set - set true to break the bones of the player, or false to heal the broken bones. true if the player is bleeding, false if not. set - set true if the player should be bleeding, or false to stop bleeding. true if the player is currently flying, false if not. true if the player is dead, false if not. rotation - the respawn rotation. Use "null" if you want to use the default rotation. Gets the current player temperature (in celsius). Note that this is not exactly the body temperature, instead this temperature value slowly adapts to the environment temperature (depending on various factors, e.g. clothing, weather etc). the current player temperature (in celsius). Sets the player temperature (in celsius). Please note that the player temperature will still slowly adapt the environment temperature. temperature - the player temperature (in celsius). Value must be between -100 and 100 (inclusive). true if the player is invisible, false if not. set - true to set the player invisible, false to make him visible again. the player idle time in seconds. Gets the mount the player is currently riding on. If the player is not riding on an npc at the moment, this function returns null. the mount the player is currently riding on, or null if the player is not riding on any mounts. the language as a string. true if the player uses the Steam version, false if he uses the Standalone version. speed - the new walking speed. speed - the new running speed. speed - the new sprinting speed. jumpheight - the new jump height. a Skin object representing the visual appearance of the character. Gets a Clothes object which contains the clothes the character is currently wearing. The object is updated automatically when the player changes his clothes. a Clothes object representing the clothes of the character. 3 //Get ClothingDef of "ushanka"
Brings up the ingame map. Usually this requires a map item to be present in the player equipment slots, however, this can be optionally ignored. If the ingame map is already visible, nothing happens. ignoreMissingMapItem - true if the map should show up independent of whether or not a map item exists in the player equipment slots, false if it should only show up if the player actually has a map item. Brings up the ingame map. Usually this requires a map item to be present in the player equipment slots, however, this can be optionally ignored. If the ingame map is already visible, only the coordinates get updated (or more precisely, the position the map shows). coordinates - the map will scroll to this position automatically. Set null to scroll the map to the current player position. smoothScroll - true to scroll the map smoothly to the target coordinates, false to update the map position instantly. Hides the ingame map. If the map isn't visible at the moment, nothing happens. Hides the journal. If the journal isn't visible at the moment, nothing happens. Shows a context menu with the given entries. Once the player selects an entry, the provided callback will be called (and the selected string will be passed as argument). entries - the entries of the context menu, as a string array. callback - the callback which will be called once the player selects an entry. The selected entry is provided as parameter (never null). If the player just closes the context menu (i.e. if he doesn't select anything), an empty string will be provided. Stops / aborts the current input actions. For example, if the player is currently digging with a pickaxe (by holding his left mouse button), and you call this method, the player will stop his actions. If he wants to continue to dig, he has to release his mouse button and press it again. stopMovement - true if you want to stop movement input (e.g. WASD). If causes the character to stop (if he's currently moving). stopActions - true if you want to stop interaction input, e.g. primary and secondary mouse buttons and interaction key (F by default). keys - all key codes the game should listen for. key - the key you want to check if it's registered. true if the key is registered, false if not. an array (which will be created upon call) containing all key codes, or null if no keys are registered. set - true to forward the key inputs, false if not. true if input will be forwarded to the server, false if not. Disables certain keys for the client. It doesn't matter if the key has any binding. This does not affect chat or console input. If you want to re-enable the keys again, you can call enableClientsideKeys(). Note: If a plugin registered a key (see registerKeys(int...), these key inputs won't be processed client side, but they will still be forwarded to the plugin. keys - the keys you want to disable. 3 keys, he won't be able to move his character anymore. Re-enables certain keys which have been disabled by calling disableClientsideKeys(int...). If you want to enable all keys again, call enableClientsideKeys() instead. keys - the keys you want to enable again. Toggles the visibility of the mouse cursor. Useful if any custom gui interactions are needed. If the cursor is set to visible, the player is unable to move anymore. You have to hide the cursor explicitly in order to unfreeze the player (in other words, the player has no chance to hide the cursor by himself). set - true to show the mouse cursor, false to hide it. Note: This even works when the cursor isn't visible (so the cursor position will still be updated in the background). relative - if set to true, relative target coordinates (0.0-1.0) will be used, otherwise the target coordinates will be treated as absolute coordinates. Executes a console command for this player. The ingame console can be opened by pressing ` or ~ or # or ^ (depending on the keyboard layout). Note that this function does not override any permissions, this means if the player is not allowed to execute a certain command, you cannot execute it with this function either (first you have to change the permissions in this case). command - the command you want to execute. It's exactly the same as if the player typed this command into his console (he even get a response in the console). true if the player is connected to the server, false if not. Gets the current ping of the player, in other words, the amount of time (in milliseconds) that passes until a player packet arrives at the server. Only relevant in multiplayer. the current ping (ms) of the player. Gets the ip of the player (only relevant in multiplayer). When playing via Steam P2P, this function returns the SteamID64 of the player (e.g. "76561197970685866"). a string containing the ip address of the player (or the SteamID64 when playing via Steam P2P, or an empty string when playing singleplayer). Kicks the player from the server. The provided reason is displayed on the screen of the kicked player. reason - a string containing the reason why the player was kicked. Bans the player permanently from the server. The provided reason is displayed on the screen of the banned player. Bans the player from the server for a given amount of time. The provided reason is displayed on the screen of the banned player. Enables the "area selection tool" for this player. This enables the player to select an area. To stop the "area selection tool", you can call disableAreaSelectionTool(). If you want to retrieve the selection result (i.e. the selected area), you can call getAreaSelectionData(net.risingworld.api.callbacks.Callback) and provide a proper Callback object. area - the area you want to adapt the selected area to. Provide null to reset the selected area (this means the player has to set a new start and end position). Gets the currently selected area. This only returns a proper Area if the "area selection tool" is currently enabled and if a start and end position is selected. Otherwise, null is returned. Since all data needs to be queried from the client, this method uses a Callback. callback - the Callback object. It will be called once the Area object has been retrieved from the player. The particular Area will be passed as argument (or null if no area was selected). Disables the "area selection tool" for this player. Does nothing if the "area selection tool" is currently not active. Remember to get the currently selected Area by calling getAreaSelectionData(net.risingworld.api.callbacks.Callback) first, otherwise the selected area will be discarded. Deprecated. Method is no longer used. Now interactions of players with objects (like furniture) are always forwarded to the server (and they are also cancellable). Performs a raycast from the screen xy position. In other words, the game checks the nearest collision (with terrain, block, constructions etc) at the given screen position. This method basically does the same as raycastFromScreenPosition(float, float, boolean, int, net.risingworld.api.callbacks.Callback), with the exception that it returns a Vector3f (the collision point) instead of a RayCastResult. Please keep in mind that raycasting can have a noticeable impact on the client performance (framerate), so use it with caution! x - the horizontal screen position (x). y - the vertical screen position (y). callback - the Callback object. It will be called once the Vector3f object has been retrieved from the player. The particular Vector3f will be passed as argument (or null if no collision was found, for example when the player looks towards the sky etc). Performs a raycast from the player view position to the player view direction, i.e. from the cam position to the center of the screen (crosshair). The game checks the nearest collision (e.g. terrain, constructions etc, this can be specified with a bitmask). Only use the collision types you actually need, since adding too many unnecessary collision types can be very expensive. callback - the Callback object. It will be called once the RayCastResult object has been retrieved from the player. The particular RayCastResult will be passed as argument (or null if no collision was found, for example when the player looks towards the sky etc). 11 //now do something with this information, e.g. create a model there, teleport the player etc. Performs a raycast from the player view position to the provided direction. The game checks the nearest collision (e.g. terrain, constructions etc, this can be specified with a bitmask). direction - the direction of the ray. If you want to use the player view direction, you can call raycast(int, net.risingworld.api.callbacks.Callback) instead. Performs a raycast from the screen xy position. In other words, the game checks the nearest collision at the given screen position (e.g. terrain, constructions etc, this can be specified with a bitmask). Performs a raycast from a world position. The game checks the nearest collision (e.g. terrain, constructions etc, this can be specified with a bitmask). The raycast is executed by the client (the player), so it can only take the world that's currently rendered into account (i.e. you can only perfom this raycast in the proximity of the player, depending on his view settings). position - the origin of the ray, i.e. where the world position you want to start the ray from. direction - the direction of the ray. Only use the collision types you actually need, since adding too many unnecessary collision types can have a big impact on performance. Attaches a GUI element to the player's hud. This GUI element is only visible for this player. guiElement - the GUI element you want to attach. Attaches a GUI element to the player's screen. This GUI element is only visible for this player. parent - the parent GUI element, or more precisely, the element where you want to attach this element to. Has no effect if this element is a child. Example parent names: "Inventory", "Crafting", "HudLayer", "LoadingLayer", "InGameMenu", "Crosshair", "Journal" etc. Removes a GUI element from the player's hud. If the specified GUI element does not exist, nothing happens. guiElement - the GUI element you want to remove. Changes the visibility of the GUI element only for this player. This calling this method ignores the current visibility state of the GUI element (see GuiElement.setVisible(boolean)). However, changes to the GUI element itself will restore the original visibility value of the GUI element. element - the GUI element. visible - true to show the GUI element, false to hide it. Adds the provided WorldElement to the player's world. Only the player can see this object. worldElement - The WorldElement you want to add to the player's world. Removes a WorldElement from the player's world. If the specified element does not exist in the player's world, nothing happens. worldElement - the WorldElement you want to remove. Note: Make sure you use a mono sound when playing it as a 2D sound. sound - the SoundInformation object which refers to the custom sound file. an internal ID of this new sound instance. This may be relevant when playing a loop sound, then you can stop the sound by providing this ID. position - the world position of the sound. Provide null if you want to play this sound as a 2D sound instead (this means the sound has no actual position and can be heard everywhere). Plays a custom 3D sound at the given position. This sound can only be heard by this player. loop - determines if this sound should play as a loop (i.e. it repeats indefinitely). If true, the sound will only stop when calling stopSound(int). maxDistance - the distance the sound becomes silent. The sound volume is interpolated between minDistance and maxDistance (default: 50.0). Sound uses a linear-square-rolloff (minDistance == full volume, maxDistance == silence). position - the world position of the sound. Provide null if you want to play a 2D sound instead (this means the sound has no actual position and can be heard everywhere). name - the name of the sound effect. position - the world position where the sound will be played. 3 //there are also other bear sounds, like bear_attack, bear_hurt etc. parameter - an optional sound parameter that can be set. Set null if you don't want to provide an parameter. Note that only certain sounds have parameters. parameterValue - the parameter value (has no effect if parameter is set to null). Stops a sound effect. This is only necessary when playing a loop sound, for example. soundID - the internal ID of the sound instance you want to stop. Changes the position of a sound. Only works if the sound isn't a 2D sound. soundID - the internal ID of the sound instance. position - the new world position. Only works for custom sounds! position - the new timeline position in seconds. If "relative" is true, use a value between 0 and 1.
relative - false to use absolute values (seconds), true to use a value relative to the total length of the sound (0-1). Enables the ingame music. This only has an effect if disableGameMusic() has been called previously. Disables the ingame music. This stops the currently playing (if any) music track and prevents the game from playing another music track until enableGameMusic() was called. This does not affect the main theme (which can be heared only in main menu and during the loading screen). Example: Disable default game music and play custom music track every 10 minutes instead. 20 //Create a timer which plays the music every 10 minutes, with initial delay of 1 minute. Please note: This does only work if the client uses Windows! ip - the target ip address of the TeamSpeak server. port - the target port of the TeamSpeak server. channel - the target channel the client should join on connect. To join a subchannel, you have to use a slash (e.g. "channel/subchannel"). 1 //Connect to IP 127.0.0.1, port 9987, channel "EntranceHall"
url - the url to the Discord server, for example "https://discord.gg/ay21koSP" or "https://discordapp.com/invite/example" etc. sizeFactor - the size factor of the image (1.0f is original width/height, 0.5f is half widht/height etc). callback - this callback will be called once the screenshot has been uploaded to the server. The screenshot is passed as BufferedImage obejct. Uploading the screenshot may take a few seconds depending on the bandwidth, traffic and screenshot size. Requests a raw map tile from a client. When calling this method, the client reads the bytes of the map tile file and sends them to the server. Keep in mind that this data is always compressed, so you have to decompress it before working with it (see Utils.ByteUtils#decompress(byte)). The bytes represent an 8 bit RGBA image. Warning: Do not use the byte array with an ImageInformation object, since the map tile data use a different format! If you want to work with the byte array, you can turn it into a BufferedImage by calling Utils.ImageUtils#rawMapTileToBufferedImage(byte) after decompressing the array. x - the x coordinate of the map tile (horizontal, from right to left). y - the y coordinate of the map tile (vertical). controlHash - optional md5 control hash. Compares the client side byte with this hash and only transfers the bytes to the server if the hash does not match. Provide null to disable this check. callback - this callback will be called once the map tile data has been uploaded to the server. The map tile data will be passed as raw byte array. If the map tile does not exist (i.e. if this part of the map hasn't been explored by the player yet), null is passed instead. Same happens if a controlHash is set and the client side hash matches the server side hash.